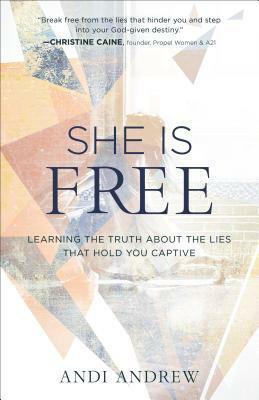 She Is Free: Learning the Truth about the Lies That Hold You Captive by Andi Andrew has an expected publication date of October 3rd, 2017 by Baker Books. We say we’re free in Christ, but many of us are still living in captivity–to fear, anger, shame, isolation, unforgiveness, and control. We’re good at faking it around others, but we’re exhausted by the ruse. Andi Andrew wants women to break free of their self-imposed prisons and live the lives that are rightly theirs in Christ. About the author: Andi Andrew is cofounder and copastor with her husband, Paul, of Liberty Church with four locations in New York City. Liberty Church is soon to be expanding in San Francisco; Swaziland; St. Petersburg, Florida; and a fifth New York location in Brooklyn. In 2015 she launched the She Is Free Conference in order to help women find freedom, strength, and wholeness in spirit, soul, and body. A frequent speaker all over the world, she and Paul have four children and live in Brooklyn. My thoughts: Andi writes a book that is full of personal stories as she shares her path to freedom in hopes that others can find theirs. She teaches you how to face your pain and how to overcome all the lies that can hold you back. This book is full of scripture and reflection that will help you realize you are not alone. Overall a good self help book.